After a six-pitch first inning on Saturday, Sabathia came apart in the second, allowing a long home run to Randal Grichuk on the first pitch, and then surrendering an infield hit, a bloop single, a line-drive hit by Aledmys Diaz and a seeing-eye single by Lourdes Gurriel Jr. Then in the third, he gave up back-to-back home runs to Grichuk and Kevin Pillar, ending his day. Sabathia, 38, was named the most valuable player of the American League Championship Series in 2009. Reliever David Robertson, 33, is the youngest team member left from that year. Gardner was batting as high as .268 in June but has fallen off badly in the second half. His .238 batting average and .328 on-base-percentage are among the lowest in the Yankees’ lineup, and on Saturday, he seemed to have trouble judging fly balls in the late afternoon mix of shadows and sun. He heard boos after striking out to end the third, although his at-bat was just the last of three consecutive strikeouts — the others came from Neil Walker and Luke Voit — that wiped out a bases-loaded threat. 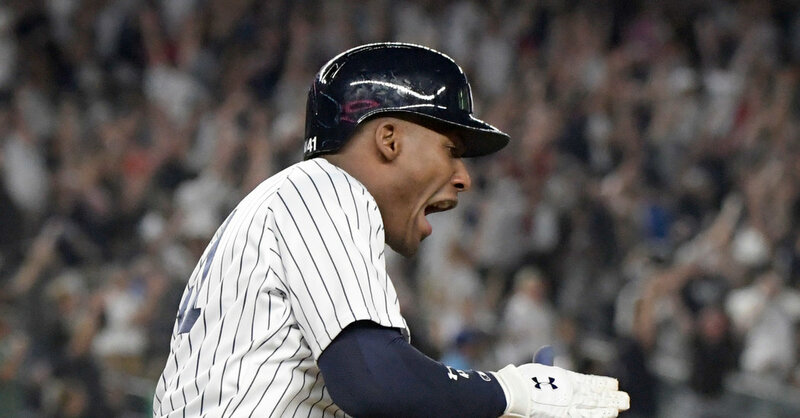 The Blue Jays led, 8-1, after the top of the seventh, but the Yankees scored six times in the bottom of the inning, which featured solo home runs by Giancarlo Stanton (his 34th) and Didi Gregorius (his second of the game and his career-high 26th of the season) and then Andujar’s slam off the former Yankee Tyler Clippard.